Ian McCarthy, charged in the murder of a Missouri police officer, has been wanted on a warrant in New Hampshire since 2013 after failing to appear for sentencing on a disorderly conduct charge. 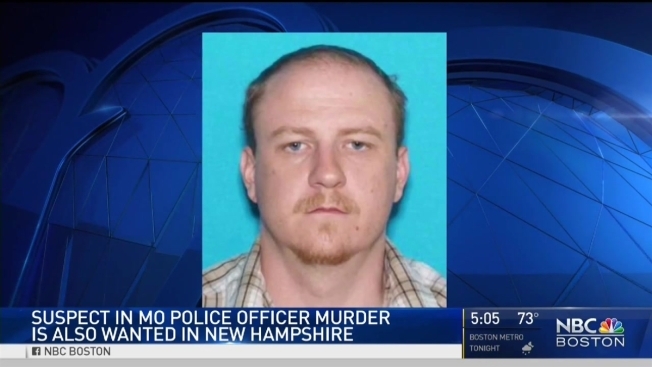 Court records show a man charged with killing a western Missouri police officer on Sunday has been wanted on a warrant in New Hampshire since 2013. The Missouri State Highway Patrol is searching for 39-year-old Ian McCarthy of Clinton, Missouri, who is charged with first-degree murder and armed criminal action in the shooting death of Officer Gary Michael. Michael was shot Sunday night after stopping a car in Clinton. The driver jumped out of the vehicle and shot Michael before fleeing. Court records say a warrant was issued for McCarthy in New Hampshire in October 2013 after he failed to appear for sentencing for a disorderly conduct charge. The records show McCarthy had an extensive criminal background in that state, with 20 counts ranging from misdemeanor traffic violations to criminal charges filed between 1997 and 2011. Missouri court records indicate McCarthy pleaded guilty in November 2013 in Missouri to a misdemeanor driving without a valid license. In July 2015 he was charged with unlawful possession of a firearm. Court records don't indicate the outcome of that case. The car Michael stopped before he was shot is registered to McCarthy. Missouri State Highway Patrol spokesman Bill Lowe said the driver jumped out of the car and fired at Michael, who was able to return fire. The suspect drove about three blocks before crashing his car and fleeing on foot. Lowe says Michael was "heroic right to the end." It is unclear if the suspect was hit. Michael, 37, was a lifelong resident of Clinton and leaves behind a wife and stepsons.